Bean soup is the official Greek national dish but souvlaki (together with mousaka of course) is what comes first to mind when people think ‘Greek food’. Although originated in ancient Greece, what you’ll savour during your stay in Athens is a delicacy with Turkish, Egyptian and Middle Eastern influences that repatriating Greeks brought home during the first half of the twentieth century. Souvlaki is a cheap, healthy and complete meal with high nutritional value as it contains balanced amounts of protein, carbohydrates and vitamins, although it can be a calorie bomb depending on the quality of the meat and the fat used in its preparation. Every neighbourhood, every street corner of every city in the country has its own souvlatzidiko, an establishment selling the quick and tasty snack. Many are tiny and cater only to the take-away trade, while others are spacious with tables and waiter service. There are super modern ones that look and feel like typical fast food outlets and others that remain exactly as they were when they first opened for business many decades ago. Some specialise in selling just kalamakia or kebabs etc whereas others offer countless combinations of ingredients catering to the quest for choice and novelty of the modern consumer. As a result, anything can be wrapped in pita bread, drowned in any kind of ‘exotic’ sauce and sold as a souvlaki these days. At In Your Pocket, we are fans of time tested recipes and originality. Based on these criteria together with taste and quality we present you with the Top 10 of joints we frequent almost daily in the centre of Athens. 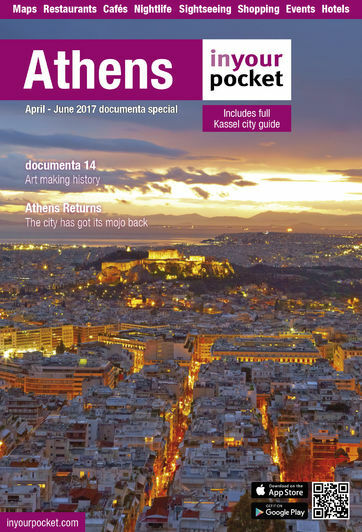 Kostas F5, Pentelis 5, MSyntagma, tel. 210 3228502. In every Athens guidebook you will invariably find the world famous ‘hole-in-the wall’ Kostas souvlaki in Plaka. Don’t go looking for it as this place shut down more than a year ago. However (and remember, you read it here first), Kostas is now back in business. He set up shop, less than a month ago, at a new location to serve his many loyal fans who insist that he makes the best souvlaki in Athens since 1950. The new premises are modern and minimal with just a tiny glill, a fridge and a sink. The only reminder of the old place is the same old sign reading ‘No stress’ in Greek. But the souvlaki is top class, and you won’t need to worry about the side-effects of the tzatziki, as Kostas uses plain yoghurt instead.”. Open 12:00 - 16:00. Sat, Sun closed. Kosta E5, Agias Eirinis Sq, MMonastiraki, No Telephone. A lunch cult for Athenians in the know. Every day, from his narrow kitchen, another Kostas serves hundreds of portions of his single speciality: Meatballs on pita bread, french fries, tomato, spicy sauce and a pickled pepper on top. Do not expect seating and service, customers enjoy their lunch standing outside, in one of Athens’ prettiest squares. With €7 you’ll stuff yourself and you’ll feel like a true Athens insider. Open 12:00 - 16:00. Sat, Sun closed. Livadia F2, Gladstonos 7, MOmonia, tel. 210 3832413. Named after the Greek town famous for its kalamaki this is a heavy-duty souvlatzidiko. A look in the refrigerator with the thousands of kalamakia waiting to be grilled will give you a good idea of the turnover of this place and therefore the freshness of the meat sold. The uneven chunks of pork on the skewer, as opposed to the perfect cubes in most places, make them look and taste homemade and are enjoyed by most on a plate with french fries and a cold glass of beer. Open 12:00 - 04:00. Sat, Sun closed. Iroon Sqare 6 E5, Psirri, MMonastiraki, tel. 210 3218219. This is actually an address as this place has no name. It doesn’t need one as it has been well known for years for its tasty fare among its fans who queue everyday during lunchtime to enjoy high quality kalamakia and meatballs served on their own or inside half a loaf of normal bread. If you are a fan of pita bread head elsewhere, none is served here. Open 12:00 - 04:00. Sat, Sun closed. Kavouras G2, Themistokleous 64, Exarchia, MOmonia, tel. 210 3838010. Feast your appetite on gyros or kalamaki, wrapped in warm pita bread and topped with tzatziki. Kavouras is a place to savour the traditional Greek souvlaki, no niceties, no refinements, just plain old hearty meat-lovers’ fare. If, while taking a stroll through the district, you feel pangs of hunger and decide to look for something on the go, give it a try, though keep in mind that good taste here is limited to the food, don’t go looking for tasteful décor. Open 10:00 - 05:00. Nikitas D4, Agion Anargyron 19, Psirri, MThissio, tel. 210 3252591. If you happen to pass through Psirri during the daytime and feel like an authentic cheap and delicious lunch, head for Nikitas. It’s easy to spot - it’s the one where the outside tables are always crammed and you may have to wait for a while, but it is worth it. This psitopolio has been serving the working crowds of Psirri since 1967 and has maintained a loyal clientele even these days with the hundreds of choices in the area. Open 12:00 - 18:00, Sun Closed . Bairaktaris E5, Monastiraki Sq, MMonastiraki, tel. 210 3213036. Mr. Bairaktaris, the owner of this historic kebab house (and a neoclassical buildings…collector!) has been feeding both the Athenian élite and working classes for decades. He loves being photographed with his celebrity customers and putting the framed pictures on the dining hall’s walls. Its strategic location on Monastiraki Square ensures it is perennially packed, despite fierce competition from its neighbours. The kebab is very tasty and the grease will keep you going for a whole day if you’re on a budget holiday! Open 09:00 - 02:00. Thanassis E5, Mitropoleos 68, MMonastiraki, tel. 210 3244705. Opposite Bairaktaris, this is the second of the three establishments making up the souvlaki triangle of Monastiraki square. Tourists just grab the first available table on the street without much thought to which of the three it belongs, but the loyal to Thanassis locals will wait as long as it takes, as they insist that the superiority in taste and quality compared to the neighbours is clear. The downside is that the menu is limited but that shouldn’t matter as a merida kebab is why you’re here for anyway. Open 09:00 - 02:00. Ellinikon F5, Kolokotroni 39, MSyntagma, tel. 210 3312138. Mother and daughter, the owners of this old central eatery work hard behind the counter to prepare a menu that extends to sausages, sandwiches with kalamaki and their own speciality: vegetarian souvlaki with chickpea balls and taramosalata. Plain yoghurt is used here too instead of the traditional tzatziki and french fries are added in the pita bread if the customer wishes. Open 12:00 - 04:00. Prices vary between €1.50-2.00 for a kalamaki, gyros or kebab wrapped in a pita bread, €1.00-1.80 for just a kalamaki and anything between €5.00-8.00 for a merida served on a plate. Souvlaki: (Athens & southern Greece only): A generic term used for any kind of meat consumed inside warm pita bread together with tzatziki, tomato and onion. In northern Greece the word sandwich is used instead, whereas souvlaki refers exclusively to kalamaki. Kalamaki: (Athens & southern Greece only) A small wooden skewer with chunks of pork or chicken meat used in souvlaki or consumed on its own with a slice of bread. Merida: Means ‘portion’ and it consists of a few kalamakia, or kebabs (usually four) served on a plate with a couple of pites and increased amounts of tomato and tzatziki. Tzatziki: Traditional yoghurt, garlic and cucumber dip.